Warm days and blue skies make for perfect conditions to relax in outdoor Turkish baths, and with amazing architecture around the city, Budapest has become one of my favourite destinations in Europe. My Australian mate, Pat, was travelling around Europe and instead of catching up in London, where I currently live, and meeting somewhere we were both had been, we’d decided to venture to somewhere new. Flights out of London to Budapest were bit pricey at the time, so instead I’d arranged to meet in Vienna so we could then travel to Hungary by train. 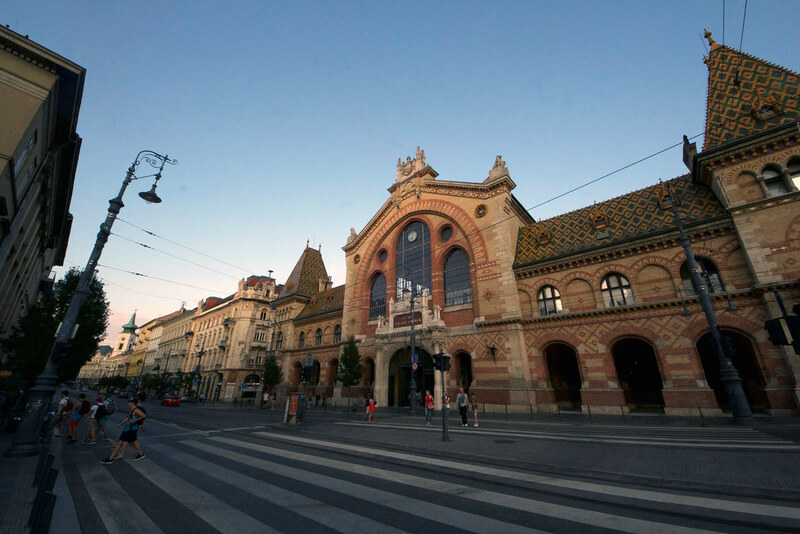 It takes about 2 hours and 40 minutes from Wien Hauptbahnhof (Vienna Central) to Budapest Central on a slow train. Departing around midday, we got to our destination in the early afternoon, checked into our hostel and went for a stroll. Both Austria and Hungary are in the Schengen area so you don’t know you’ve crossed a border unless you have roaming on your mobile phone and you get a text messages when you switch network carriers. We arrived in Budapest on a day that could only be described as a fine example of a European summer. The sun wasn’t going to set until after 8pm, most tourists and locals were out and about wearing shorts and t-shirts, and you could spot the two Australians by our thongs (flip-flops). There were plenty of people eating out, having a drink, and enjoying the sunshine. For those who aren’t aware, Budapest was two cities (Buda and Pest) separated by the Danube River that became unified in 1873, with each side of the river maintaining their names – mind blown! Buda on the west bank is hilly and has the castle and presidential palace, while Pest on the east is flat and has the house of Parliament. In many ways the unification was of a Yin and Yang combination – geographically, socially and culturally – that demonstrates polar opposites can live in unity (it was far more nicely put by the walking tour guide). There are several bridges that link the two sides, the main one and perhaps prettiest is the Chain Bridge. But on this particular occasion on the Liberty Bridge, because the trams were halted due to maintenance further down the tracks, local Budapestians had made camp for the evening with musical instruments, light supper, and bottles of beer and wine. It sums up perfectly how I see the European life – they understand how to have a good time. No one was rowdy, inconveniencing anyone else and subsequently the party was not moved on or shut down. As I’ve mentioned in previous posts, I’m a big fan of the free walking tours when I explore new cities. Mainly it’s a chance to meet other travellers and a good starting point to get your bearings and get good advice on places to eat, see and do. I highly recommend the Triptobudapest that begins just outside the Jewish area. The Original Tour, which goes every morning, takes about three hours and finishes at the castle on the Buda side. After digging in to some local cuisine for a late lunch, Pat and I (with some newly found Canadian friends from the tour) continued exploring the citadel and then climbed to the Liberty Statue to get a good vantage point that looks back on to the city for a few photos, before ending the afternoon with a relaxing dip at the Gellért Thermal Bath. Without a doubt, one of the best things to do in Budapest is have a relaxing swim at a thermal bath. There are several around the city, the biggest medicinal bath in Europe is Széchenyi, which is about a 40 minute walk from the inner city or a 10-15 minute metro ride (the stop is Széchenyi Furdo on the M1 line). It has two large thermal pools outdoors while several indoor spas and can get really busy in the afternoon, while smaller Baths like Gellért can also draw the crowds but are not generally as popular. The water temperature is set differently in each pool and can reach up to 40 degrees. You can also sit in a saunas and then throw yourself in to a cold bath if you feel like getting an unnecessary head spin. If you are in Budapest, it is definitely worth setting a side a good couple of hours to relax. Budapest has stunning architecture that is diverse in styles – mainly because of when construction began, and the city also has a fascinating history of being captured and claimed by several empires. A large Jewish quarter is frequented by tourists because of it’s great social vibe – good eating areas and places for cheap drinks. Ruin pubs are also popular places and are a must visit when you spend time in this vibrant city. There’s plenty to do, and the great thing is that it won’t break the budget. Pat and I mostly walked to our destinations – there really isn’t much of a need to use the public transport network because the city is quite small, perhaps only getting in and out of the main train station which is outside the inner city. You can easily spend a week (or even more) in Budapest and I thoroughly recommend putting it on the bucket list of places to go when in Europe!